Every year on the 28th September, health workers, charity campaigners and ordinary people affected by rabies gather to promote World Rabies Day. This annual event first began a decade ago, and is designed to spread awareness about the threat of rabies. Two years ago a global rabies conference agreed upon a common goal: to lower human deaths caused by rabies to zero by the year 2030. As a result, the theme of the day for this year is ‘Rabies: Zero by 30′. As with any global disease, it’s believed that one of the best ways to decrease mortality rates associated with rabies is to better educate people; in an effort to spread awareness, we’ve put together a guide of our own. Read on, share on social media, and get involved with World Rabies Day 2017. Rabies is an infectious viral disease spread to humans by the bite or scratch of an infected animal (usually a dog). Once it has been contracted, the virus can spread to the central nervous system. If symptoms begin to develop, it is nearly always fatal (it’s thought that the disease kills tens of thousands of people every year). The good news is that vaccination before exposure, or after exposure but before symptoms present, is very effective. Rabies is most commonly found in Asia, Africa and Central and South America, which means vaccination is often recommended for people travelling within these continents. The rabies virus is normally transmitted through the saliva of an infected animal, however it’s also present in infectious material such as brain tissue. The rabies virus cannot cause an infection through unbroken skin. Typically, transmission occurs when you are bitten or scratched by an infected animal and the bite or scratch breaks the skin. Less commonly, infection can occur when an infected animal licks an open wound, or infected saliva or brain tissue comes into contact with an open wound, or gets into the eyes, nose or mouth. What happens if I am bitten or scratched? After infection, the rabies virus gradually moves from the exposure site to the brain. During this time, which is known as the incubation period, no symptoms are apparent and the infected person cannot pass on the virus. Only once the virus has reached the brain does their saliva become infectious – at this point the infection is likely to be fatal. Rabies symptoms can take a long time to present, typically between three and 12 weeks but occasionally up to one year. The length of time it takes for symptoms to appear is dependent upon the location of the exposure site and the amount of virus that has entered the body. Paralytic rabies is characterised by a slow paralysis, followed by coma. Emergency rabies treatment is administered depending upon the circumstances of exposure. A minor scratch would likely be treated with a course of the rabies vaccine and treatment of the scratch. A more extensive wound may also require one dose of an emergency treatment called immunoglobulin. 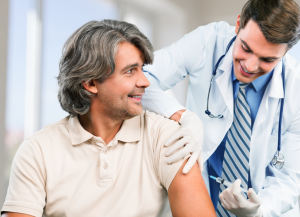 If you’ve already received the rabies vaccine you will need two shots of the vaccine over a few days; if you’ve not received the vaccine you will need five shots of it over four weeks, along with immunoglobulin. You should consider getting the rabies vaccine if you’re travelling to any high-risk areas; before travelling, speak to a doctor or nurse about your risk. You can also check the rabies status of different countries here. The rabies vaccine requires three injections over the space of one month, so you should plan ahead to ensure you have enough time before you leave the country. To learn more about the rabies vaccine, visit our online clinic. You can read about the rabies booster here.